Lyme disease, also known as Lyme borreliosis, is an infectious disease that is transmitted to humans through bites from infected ticks. Transmission becomes more likely the longer a tick is attached to the skin. Ticks live in grassy and wooded areas in rural and urban locations. Lyme disease can cause a wide range of common and unspecific symptoms. Many people with the disease may not remember having a tick bite, so diagnosis can be difficult. There are about 3,000 cases a year in England and Wales, according to Public Health England. If left untreated, infection can spread to the heart, joints and the nervous system. Guidance to help nurses, GPs and other staff identify Lyme disease has been published by the National Institute for Health and Care Excellence (NICE). The guidance aims to ensure that people with suspected Lyme disease are given early and consistent treatment. 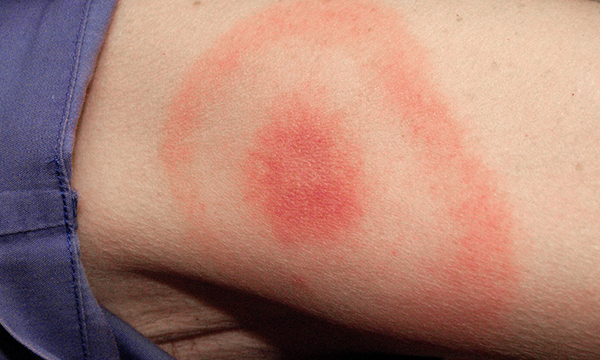 If a person who has had a tick bite develops a circular red rash, known as erythema migrans, NICE recommends treatment with antibiotics. For those without erythema migrans, clinical presentation and lab tests should be used together to diagnose Lyme disease. If these tests come back negative, but unexplained symptoms persist, doctors should seek a second opinion from a specialist. NICE says Lyme disease should be diagnosed in people with erythema migrans – a red rash that increases in size and is not usually itchy, hot or painful. It usually becomes visible one to four weeks after a tick bite and is usually at the site of the bite. Lyme disease should be considered when there are a range of other symptoms, including fever and sweats, swollen glands, malaise, fatigue, migratory joint or muscle aches and pain, cognitive impairment, headache and paraesthesia. The guidance also points out it can cause a range of other conditions, including heart conditions, neurological symptoms and eye problems. The condition is caused by an infected tick bite and can occur anywhere in the UK, although Scotland and the south of England have a higher incidence. Worldwide, Lyme disease occurs mainly in the northern hemisphere, and travellers to areas of Europe, North America and elsewhere may be at risk. People who spend time in grassy or wooded areas are at increased risk of exposure to ticks. Offer information about where ticks are commonly found, and advise people to cover exposed skin and use insect repellent if they suspect they may be at risk of tick bite. Be aware that most tick bites do not transmit Lyme disease, but prompt, correct removal of ticks reduces the risk. Be cautious about diagnosing Lyme disease in people without supportive history or positive serological testing, because this risks missing an alternative diagnosis and providing inappropriate treatment. ‘Nurses and midwives need to know that tick bites don’t always cause Lyme disease, and not all tick bites are visible. Timing is important, as infections can appear from days to weeks after a tick bite and can last for many months. This means nurses need to ask their patient if they have recently visited places where there is a high risk of contracting the condition, such as woody or grassy areas. ‘Nurses can also provide their patient with helpful advice about how to reduce their risk of getting Lyme disease, such as covering legs and using insect repellent that protects against ticks.